It's been over six months since our last month of side control, so I decided it was time to revisit maintaining side control. I kicked off with the conceptual framework John described to me in Texas, which I've mentioned before: the primary control points are the hips and the triangle of shoulders and head, secondary control is inside the knees and elbows, then finally tertiary control relates to the wrists and ankles. John goes into more detail over on this thread. I think it's helpful to have that framework at the start, as then the students can hopefully see how that principle filters through everything we'll be training today. 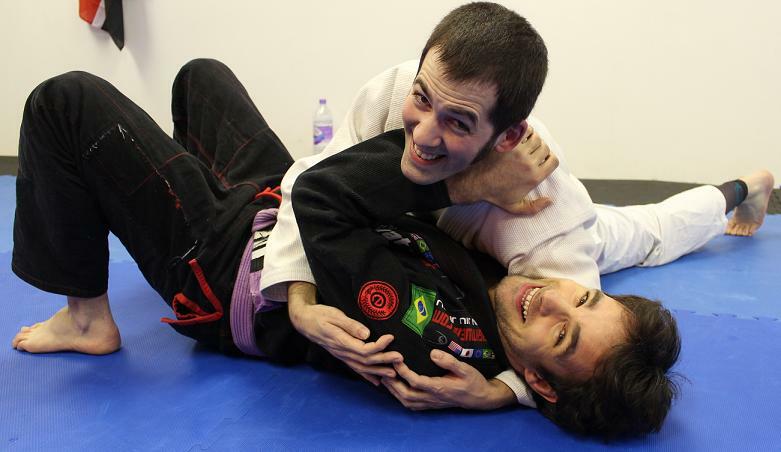 Teaching Notes: I thought hard about whether to go with the orthodox side control maintenance lesson tonight, or try something I teach less often, like scarf hold or north-south. I eventually decided that there are a number of people who weren't here when I last taught this lesson in October, not to mention that it is sufficiently fundamental that it's well worth showing at least a few times a year. I'm therefore going to bring in the 'rarer' lessons later in the week. Thursday is a good 'testing' space for me, meaning I will do either scarf hold or north south that day. For the Wednesday, that's the biggest class with the most room. That means it should work well for my other fundamental side control maintenance lesson, where I talk about the 'hip to hip' method. It doesn't take all that long to teach it, but lends itself to lots of resistance drills. I could potentially add a transition to scarf hold as part of that, something I want to test out for Wednesday.